Result launches its new mid-season 2017/2018 ranges that include new garments and accessories. 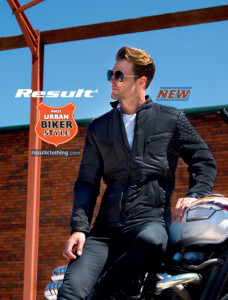 The new R402X Biker-style Jacket is a classic biker-style jacket with heavy stitch detail, tag free and ready to brand . This lightweight, soft padded, slim fit, showerproof and windproof jacket has a 160g 100% Polyester filling and 100% 210T Polyester lining. You can decorate the jacket by embroidery, decoration access is via the left chest and back hem. It features stud fastening collar & cuffs, zipped chest pockets, multiple stitch detail, hang loop. The jacket is available in sizes XS-4XL in the colour black. The new R406X Stonewash Denim Soft Shell is a rugged stone wash denim 3 layer soft shell jacket with a vintage jailhouse appearance, it is tag free and ready to brand. The durable waterproof finish, high stretch fabric delivers comfort and enhanced freedom of movement. The TPU membrane provides breathable, water and windproof protection and the microfleece inner layer provides insulation and overall warmth. The jacket features a full front antique zip and front pockets, knitted rib cuffs and waist, decorative top stitch and chin guard and is available in the sizes XS-4XL in the colours Washed Black and Washed Blue. It can be decorated by embroidery , the decoration access is open. The R326X Denim Texture Rugged Jacket is now available in a new Navy colour. 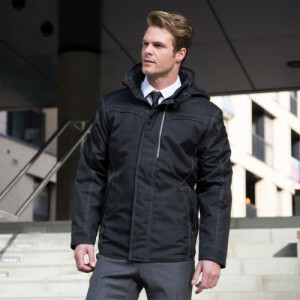 The jacket is a waterproof (1500mm), breathable (2000g) and windproof winter weight jacket that features a heavy-duty 2-way zip with interchangeable colour pulls to fit with any corporate management look. This hard-wearing ready-to-brand and tag-free jacket features contrast twin needle stitching and bar tacks, a fashion shaped longer back panel, four outer and two inner zipped pockets, quilted part-fleece lined, stud-closing storm flap, D-ring in pocket, tear-release cuff, removable hood, taped seams, reflective details for extra visibility in low light, adjustable hem, stand-up collar and hangtag. The unisex jacket is available in sizes XS-4XL in Black and Navy and can be decorated by embroidery, transfer and print, decorators access points are Inner left chest & lower back.